We’d love your help. Let us know what’s wrong with this preview of The Red and the White by Andrew R. Graybill. To ask other readers questions about The Red and the White, please sign up. Along with slavery, the story of U.S.-Indian relations is the singular, defining event of American history. The conflict (martial, political, moral, and cultural) predated slavery and continued long after slavery’s demise. It is an incredibly complex topic – denying easy explanation – which makes it endlessly fascinating to study. Andrew Graybill’s The Red and the White approaches this subject through a case study of three generations of the Clarkes, a mixed-American family. It is an ambitious u Along with slavery, the story of U.S.-Indian relations is the singular, defining event of American history. The conflict (martial, political, moral, and cultural) predated slavery and continued long after slavery’s demise. It is an incredibly complex topic – denying easy explanation – which makes it endlessly fascinating to study. Andrew Graybill’s The Red and the White approaches this subject through a case study of three generations of the Clarkes, a mixed-American family. It is an ambitious undertaking of a potentially epic tale; unfortunately, this slim book does not deliver on all it promises. The Red and the White begins in 1844, when fur trapper Malcolm Clarke wed a Piegan woman named Coth-co-co-na (roughly translated to “Cutting Off Head Woman”). As Graybill notes, such marriages were not uncommon for the time, and far more acceptable than mixed-marriages between blacks and whites. Together they had several children, and lived together on a ranch in Prickly Pear Valley, north of Helena, Montana. In 1869, a group of Piegan warriors, headed by a man named Owl Child – who shared bad feelings with Clarke – arrived at the Prickly Pear ranch. Malcolm invited the Indians for supper. At some point, the Piegans turned on Clarke, and Owl Child put an axe through Malcolm’s forehead. The murder sparked one of the bloodiest and least known Indian massacres in U.S. history: the Marias River Massacre. On January 23, 1870, Major Eugene Baker (possibly drunk) and the Second Cavalry, attacked a village located at the Big Bend of the Marias River. The village, a band of peaceful Piegan lead by Heavy Runner, had no connection to Owl Child or the renegades who’d killed Malcolm Clarke. To the contrary, Heavy Runner’s people had been decimated my smallpox; most of the men were out hunting. It was a village of the very young, the very old, and very sick. This did not stop Baker. Following the initial blast, the other soldiers on the bluffs opened fire immediately. Most of the men were armed with Springfield rifles or Sharps carbines, both of which used a heavy, .50-.70 caliber brass cartridge, an earsplitting charge strong enough to bring down buffalo and other heavy game…Though virtually no resistance came from the camp, firing continued unabated for almost an hour before Baker called a halt to the shooting and then loosed his cavalrymen upon the Piegans. The troopers swept down from the ridge and charged into the defenseless camp with pistols or sabers drawn, shooting and slashing indiscriminately as the Indians sought cover among the few lodges still standing…Other troops, who had forded the river just before the shooting began, rounded up captives and corralled the Indians’ sizable horse herd. It was all over before midday. Somewhere between 100 to 200 Indians were killed, at the loss of one cavalryman. The Marias River Massacre is the endpoint of Malcolm’s story. Graybill then goes on to follow the lives of Malcolm’s daughter Helen, and his grandson John. Graybill’s ostensible point is to explore the difficulties of mixed-blood individuals living in a world of sharply defined racial classifications. Certainly, this is an interesting idea. The Clarkes straddled a strange boundary where they were not accepted as white, nor loved as Indian. After all, Malcolm was a white man married to an Indian who was murdered by an Indian; his son Horace was half-Indian and participated in the Marias River Massacre, killing his mother’s people to avenge his white father. It’s almost the definition of tragedy. The problem with following the Clarkes, however, is that they are more exceptional than representative. Helen Clarke was a beautiful woman who spent time in New York as a mildly successful actress. In 1882, back in Montana, she ran for superintendent of the Lewis & Clark County school district. She won, becoming the first female in Montana to achieve elected office (she technically tied for first, since another woman won the same office in a different county). Later, President Benjamin Harrison appointed her as an allotment agent for the U.S. Indian Service. The grandson, John C. Clarke, lived just as full of life as his aunt. Born to Malcolm’s son Horace (who was wounded in the attack that killed his father), John Clarke lost his hearing after a bout of scarlet fever. While attending the Montana School for the Deaf, he was introduced to woodworking. He moved to Midvale (now East Glacier Park) and opened a gallery. His work was lauded by famed western artist Charles Russell. His pieces were purchased by President Harding and John D. Rockefeller. He married a white woman named Mary Simon and they adopted a two year-old named Joyce (who later did much to preserve her father’s work and legacy). The stories of Helen and John Clarke do not necessarily depict lives circumscribed by racial circumstances. They are not caught “in between” worlds. To the contrary, their lives were marked by many pan-racial successes. They faced racial difficulties, to be sure, but were able to lead accomplished lives. Don’t get me wrong. This is a cool story. I just don’t think it fits into Graybill’s attempt to use this family to gain a wider understanding of the American experience. The chief reason I purchased this book was to learn more about the Marias River Massacre. The Red and the White advertises this gruesome encounter as its focal point. However, only a handful of pages are devoted to the Marias River. The massacre itself is told in literally two pages. I try not to punish authors for the sins of copy editors, but this affected my overall reading experience. I’m glad I finished it. I’m glad I learned a little about Helen Clarke, and especially John Clarke, who seemed to be a good and generous man. (On page 219, there is a remarkable photograph of John and his adopted daughter Joyce. John is holding one of his carvings. Joyce is holding a doll. They are both looking into each other’s eyes and smiling. It is a beautiful picture, and when I look at it, these two people I won’t ever meet don’t seem like strangers). The fact remains that the book is not what it purports to be, though it is not at all bad at what it actually is. Another sad tale of our American expansion westward. Very well written and documented history of the Clark famiy saga. After setting the "stage" at the books beginning, it began to grip me and pull me in. Again, I find it sad that a country supposedly built on Christian principles can have so many people and leaders full of never-ending hate, greed, corruption, and full of "self". The story surprised me with it's ending narative of John L. Clark which now ads a place on my "bucket list" that I'd Another sad tale of our American expansion westward. Very well written and documented history of the Clark famiy saga. After setting the "stage" at the books beginning, it began to grip me and pull me in. Again, I find it sad that a country supposedly built on Christian principles can have so many people and leaders full of never-ending hate, greed, corruption, and full of "self". Malcolm Clarke ranched on Prickly Pear Creek, south of Helena, where he ran cattle and lived with his wife, a Piegan Blackfoot Indian named Cutting Off Head Woman, whom Clarke had married while a factor for the American Fur Company working out of Fort Benton on the Missouri River. Also on the ranch in August, 1869, were Clarke’s son Horace and daughter Helen, both Metis, or “mixed breeds”, who lived in a bifurcated world suspended between the White and Piegan worlds of frontier Montana. Malcolm Clarke was a successful and famous fur trader. He was recognized as a “friend” to the Indians. But he also had a temper and was known for his numerous violent encounters. One of those encounters was with a young Piegan named Pete Owl Child, who had his own violent streak caused by anger at increasing White encroachment on Blackfeet land, Piegan grievances against Clarke’s company, and the cultural despair common to many younger Blackfeet warriors. Pete Owl Child was a cousin to Horace and Helen and his father was brother to Clarke’s wife. These facts make Malcolm Clarke’s murder by Pete Owl Child and his small raiding party one day in mid-August 1869 particularly grim. Though shot in the face, Horace survived. Andrew R. Graybill’s new book, The Red and the White is a beautifully written and carefully researched account of the facts leading up to what is now known as the Marias Massacre in which more than 200 peaceful Piegans were killed by 400 heavily armed soldiers of the U.S. Second Cavalry before dawn on a cold winter day in January, 1870. Among the armed men was Horace Clarke, half Piegan. Sanctioned by the infamous Indian Killer William Sherman, the cavalry assembled under the command of Major Eugene Baker, an infamous drunkard. Riding against Mountain Chief’s Blackfeet band, Major Baker’s force paused at dawn on a bluff overlooking the Big Bend of the Marias River and saw a slumbering encampment. Unfortunately, the encampment was that of Heavy Runner’s people, mostly women and old men, whose loyalty was strictly to the Great Father in Washington. Baker was under orders to avoid conflict with Heavy Runner, but he attacked anyway and four hours later two hundred Indians were dead, many wounded, the camp burned, and survivors, including children, taken away. Mountains Chief’s band, camped a few miles downriver, escaped. Graybill, a professor of history and director of the William P. Clements Center for Southwest Studies at SMU, has written a gripping Western saga. But more, he has plumbed the depth of racial and generational conflict by means of previously unexamined archival material and interviews with descendants on both sides. The Red and the White examines the fur trade, alcohol, disease, and racial attitudes, all within the larger context of Western history and the Clarke family saga which includes a look at the lives of Helen, Horace and their heirs. The book is beautifully made, stocked with both vintage and original photographs, and contains a superb bibliography. Western history buffs and general readers alike cannot fail to profit from a careful reading of its pages---dramatic, heartbreaking and wise. Major Baker, disgraced, died drunk and penniless. This is the last of a trio of books I've been plodding through for what seems like months. As the title suggests, this book, written by Andrew Graybill, focuses on a family, in fact three generations of a Montana family, beginning with Malcolm Clarke, an early white settler who entered the picture at the end of the 'buffalo days'. Malcolm married a Blackfoot woman, Coth-co-co-na, with whom he had several children. In those early days, there were few white women on the frontier, so mixed race marr This is the last of a trio of books I've been plodding through for what seems like months. As the title suggests, this book, written by Andrew Graybill, focuses on a family, in fact three generations of a Montana family, beginning with Malcolm Clarke, an early white settler who entered the picture at the end of the 'buffalo days'. Malcolm married a Blackfoot woman, Coth-co-co-na, with whom he had several children. In those early days, there were few white women on the frontier, so mixed race marriage was a common and accepted practice. Malcolm became very successful, owning a large ranch north of Helena, which is now the Sieben ranch owned by the family of Senator Max Baucus. He was even among the individuals that started the Montana Historical Society. Nonetheless, these were also the years in which the Blackfeet lost their traditional way of life due to white encroachment. So it was a stressful time that included Malcolm's murder by a Blackfoot Indian whom he had offended, and the Marias Massacre of a Blackfoot band by the U.S. Army. The story then turns to Malcolm's daughter Helen, who navigates the changing world in which those of mixed ancestry begin to be discriminated against in Montana. Moreover, as a woman, opportunities are even scarcer yet. Nonetheless, she spends time on Broadway as an actress, serves as the superintended of public schools in Helena, and works as an allotment agent for the Bureau of Indian Affairs in the Midwest. She finally settles for the remaining decades of her life with her brother in East Glacier, on the Blackfoot Reservation. The book ends with the story of John Clarke, Helen's nephew and Malcolm's grandson, who also leads a remarkable life. John loses his hearing after getting sick as a young boy. He has some good breaks in the schooling he receives at various deaf education institutions, becoming fluent in sign language, but never actually learning to speak or read lips. He returns to East Glacier at around 20, and never leaves, becoming a nationally known carver/sculptor, a craft he plies until the end of his days. His love for hunting and fishing in Glacier Park are also a major part of his life. This is a very interesting and readable book, even if it is written by a historian. It shows how much things change over time. When you're living it, change seems slow, sometimes even non-existent, but looking back over three generation of this remarkable family, you can see the immensity of change, and also the resiliency of the human spirit. 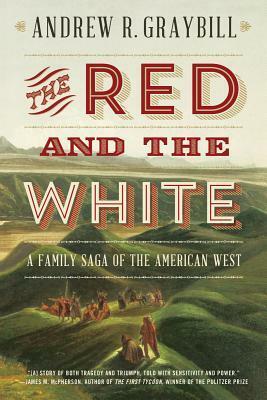 Andrew R. Graybill’s “The Red and the White” offers an intriguing account of how a Montana family negotiated the conflict between white settlers and Native Americans that has scarred the history of the American West. Graybill narrates the experiences of Malcolm Clarke and his descendants. In 1844, Clarke, then a trapper, married a Piegan Indian woman named Coth-co-co-na at a lonely fur-trading outpost along the Missouri River. The affectionate union produced four children, but Clarke — in what was a fairly common practice at the time — took a second Native American wife and fathered four children with her. By 1869, the entire family lived under one roof at Clarke’s Prickly Pear Valley ranch. Clarke’s mixed family provided no protection from the tensions arising as white settlers encroached on Indian land. On Aug. 17, 1869, he was shot at point-blank range by Piegans at his ranch. The murder inflamed fears of an uprising and led to a punitive expedition by U.S. troops the following winter. The expedition culminated in the massacre of as many as 217 Piegans along the Marias River, a tragedy compounded by the fact that the Army attacked the wrong band. Among those riding with the cavalry that day was Malcolm Clarke’s son Horace, who had been shot in the face the day his father was killed but miraculously survived. Up to this point, Graybill’s account seems unfocused and anecdotal, but its direction becomes clear as he recounts how Malcolm Clarke’s descendants navigated the cross currents of their dual heritage. Despite his participation in the Marias River attack, Horace remained well regarded by the Piegans and assisted in their efforts to win restitution from the government for the massacre. After a brief career on the New York stage, Horace’s sister Helen enjoyed political success as one of the first women elected to public office in Montana before rising hostility toward mixed-blood Montanans drove her out of the territory. John Clarke, Horace’s son, became a noted artist whose work focused on Native Americans and Montana wildlife. Graybill occasionally provides a distracting excess of background information about peripheral or irrelevant personalities (for example, an account of the travails and triumphs of theatrical impresario Edwin Booth). But his story of how one family walked “in two worlds — one red, the other white” — is, in the end, fascinating and often moving. I’m a biased reader. I was born in Montana and I have been to most of the locales mentioned in this book. Some of my ancestors were in Montana in the 1860’s when Malcolm Clarke was murdered on his ranch. Despite my familiarity with Montana’s geography and history I found much I didn’t know in Andrew Graybill’s excellent family history: The Red and the White starting with the scale of Marias Massacre. I knew of the event but was unaware of the large number of casualties, over two hundred, and the I’m a biased reader. I was born in Montana and I have been to most of the locales mentioned in this book. Some of my ancestors were in Montana in the 1860’s when Malcolm Clarke was murdered on his ranch. Despite my familiarity with Montana’s geography and history I found much I didn’t know in Andrew Graybill’s excellent family history: The Red and the White starting with the scale of Marias Massacre. I knew of the event but was unaware of the large number of casualties, over two hundred, and the disturbing fact that the US Calvary mistakenly attacked and slaughtered a band of friendlies. Graybill considers the Marias Massacre on par with more famous events like Wounded Knee and when you read through the details it’s hard to disagree. Perhaps in years to come the Marias Massacre will become as well-known as Montana’s most famous Calvary outing: Custer’s Last Stand. The massacre is a small part of The Red and White. The book tracks the life stories of Malcolm Clarke, his Piegan wife Coth-co-co-na and their children Helen Clarke, Horace Clarke and his grandson John Clarke. Malcolm’s descendants were mixed blood. In the 1840’s when Malcolm and Coth-co-co-na were married on the upper Missouri mixed marriages were fairly common, but as white civilization took hold and eventually dominated Montana attitudes changed. Despite society’s barriers Helen and John achieved far beyond what was expected of “breeds”, woman and the “deaf and dumb.” People are more than where they came from or the peculiar mixture of their genes. Prejudice, fear and dismissive behaviors are more common when different races and cultures collide; we cannot help ourselves, but books like The Red and White can help us be a little better. Wonderful panoramic view of Montana of the 1850's and the Massacre of Malcolm Clarke. Also, well documented social, political and legal status of mixed Indian-American couples and their children who grew up in that era. Interesting information delivered in a didactic, professor's monotone. I can't really rate this as I did not finish it - library book was due.